According to the European Commission, in the period of 1990/2016, the reduction of greenhouse gases in the EU area was 22%; but GDP growth was 54%, slightly above 2% annually, and the goal is to keep this pace until... 2050! 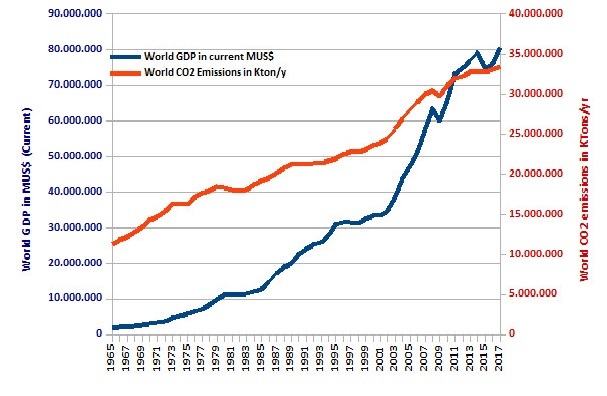 The disparity in the evolution of emissions and GDP is large and a result of the reduction of industrial activity in Europe and the USA, in parallel with the fundamental contribution to GDP of the impact of financial business, which will not be among the most aggressive entities in the environmental area. The following graph shows, therefore, that the world GDP resumed its accelerated growth after the financial crisis, in a much more dynamic evolution than the one observed for CO2 emissions that have maintained the same upward and regular pace, which comes from the past; and which results essentially from other than the European or North American areas, as we shall see in more detail below. 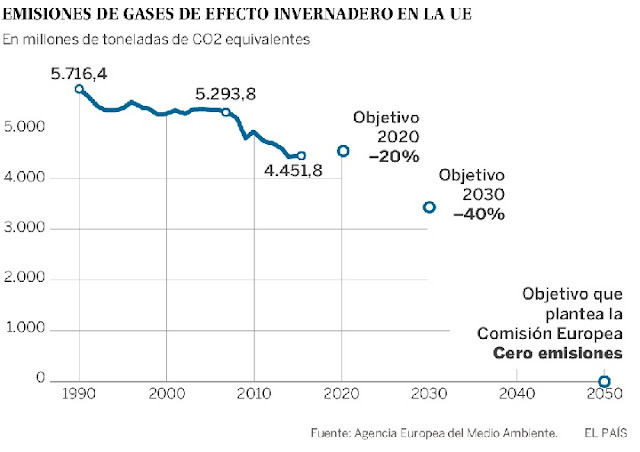 More precisely, and in the case of the EU (see figure below), following the change in greenhouse gas emissions from 5716.4 Mt CO2 equivalent in 1990 to 4451.8 Mt in 2017 (minus 468 Mt / y) the aim is to achieve reductions of... 1935 Mt / y until 2050, until the zero emission level is reached! Are they thinking that all of the industry will leave Europe? That public transportation will oust the private car? Or that all of these will be electric, with all the motive power obtained from renewable sources or imported from outside Europe? Or that the car traffic limitation, planned for the center of several European cities, will suffice for this? That the heavy lorry traffic on European roads, or of boats in ports, will substantially slow dow? That airspace will become less saturated along with a sinking of the tourist industry? And that there will be mass production of solar-powered aircraft? Is it likely that the delocalized emitter activities will keep the generated CO2 concentrated around them, without it spreading throughout the planet in a more or less uniform way, not distinguishing the territorial spaces of the delocalizing countries from those that received the harmful activities? Planning irresponsibly has never been difficult, especially for those who probably will not see the calendar arrive in 2050. Whoever gets there will take care of the issue... Brussels bureaucrats might be thinking. However, things are more complicated than the above-mentioned EU-envisaged performance, a forecast aimed at shining at the recent Katowice summit. 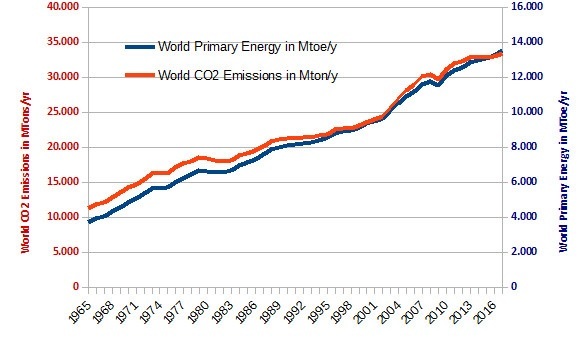 There is a historical parallel between energy production and CO2 emissions (see figure below); and replacing a fossil fuel presentation form for another, always leaves at its base a CO2 production. One may start to cook on a fire, then move to a stove burning oil, then to another using gas or electricity, and there will always be a portion of CO2 releaed; unless the energy comes from a renewable source or from… a nuclear plant. Meanwhile there was a massification of the irrational use of the personal automobile, the use of the airplane, of long journeys in the logistics chains and the distribution, to the detriment, for example, of the train; similarly, the use of electrical outlets, batteries in a multitude of objects and appliances, in industry, in services, in homes, in pockets or in ears. The bottom line is that only a small portion comes from hydro, solar or wind power... as will be seen in this text, in Annexes 1 and 2. The problem of the recycling these batteries and the rarity of the metals used in mobile phones and the like, crosses with the savagery and crime economy that surrounds much of its extraction in Africa, the richest continent in those metals. The nuclear power plants’ fuel, despite them not emitting CO2, requires solutions to radioactive waste, which are expensive if they are to be minimally decent; or they can be cheaper, if it is dumped in some countries, traded for an offshore dump of strong currency, at the order of the local oligarchs. In addition to the forwarding of waste, one also needs to consider the devastating, albeit atypical, cases of Chernobyl or Fukushima; this is despite highly regarded scientists such as Lovelock, considering that nuclear would be an excellent solution for energy production, since it does not produce greenhouse effects. The different phases of capitalist development that coexist in the world correspond to different levels of energy consumption. In richer countries, capital accumulation and the availability of technologies allow, on the one hand, to invest in less polluting forms of energy production; and at the same time to export the most "dirty" industries or to relocate only segments – or even a whole range – pertaining to a given end product, to places where labor is cheaper and wage or environmental standards are less demanding. In poor countries people do not like to live with shortages of food, health, or education, with less longevity or in the midst of garbage and pollution; but would like to have the goods and services that exist in the more developed countries. 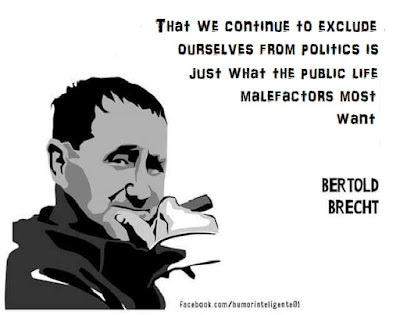 And, therefore, they accept to be a mix of beneficiaries and victims of the skewed distribution of capitalist production, whose main determinants and beneficiaries are the large, profit-hungry multinationals who delegate to oligarchs and corrupt nationals the role of managers of their own peoples, treated as cattle. Following the "export" of rubbish or pollution, the richer countries may present themselves as more environmentally advanced, with a high level of environmental refinement and very environmentally friendly; and focus on business areas where capital turnover is faster and material investment smaller – the financial area and the demanding services requiring higher qualifications – consulting, advertising, content, information management... Their bad luck is that there is only one planet, that its various parcels are integrated through growing and ever more dense interconnections; with relocation, emissions only change the location on the planet where they occur, and that does not change anything in planetary terms. The evolution of global energy consumption shows that in ten years its volume increased by 16.6%; which, though falling short of the growth of the global economy, is still worryingly high. However, it highlights two very distinct realities that separate the world into two distinct blocks. One, consisting of three sets – Europe, North America and the former CIS – where consumption is reduced; and another reality where consumption increases, comprising the countries of the Middle East, Central and South America, Africa and Asia-Pacific, according to the classification of countries used by BP – British Petroleum. There are, of course, within each set, different situations in what concerns the evolution and size of consumption (see Table I). Another interesting approach would be to observe the correlation between variations in energy consumption and variations in income; especially taking into account the impacts of the financial crisis, which manifested itself in different ways in various latitudes. Among the selected European countries, there are significant decreases in Great-Britain, Italy and Spain but a strong increase in Turkey showing a trend with a profile closer to its south neighbors’, in the Middle East. In North America the decline in consumption is marked by the regional relevance of the United States. In the former CIS there is a decrease which represents the balance of the increase in Russian consumption compared with the large reduction in Ukraine (around 40%). In terms of consumption increases we highlight the cases of Central and South America, the Middle East and Asia-Pacific. In the first case, Brazil stands out. As for the Middle East, the major oil and gas producing powers are also huge consumers, especially Saudi Arabia, whose global consumption is close to Iran’s, although with a population three times smaller. Finally, in Asia-Pacific, there is strong consumer growth inherent to the region's journey as the main dynamic pole of the global economy; in this region, two of the most capitalized economies – Japan and South Korea – show antagonistic directions in the area of energy consumption evolution. Still with regard to Japan, it is worth noting the 90% decrease in nuclear energy (in addition to oil) as a result of the Fukushima disaster, partially offset by increased use of gas and the recourse to renewable energies. India, in the table above, is the country with the highest consumption growth; however, their overall consumption is close to a quarter of the Chinese consumption, although their respective populations are close in numbers. It should also be noted that China is the world's largest energy consumer and accounted for about half of the increase in world consumption between 2007 and 2017. In short, the world is in colors but from the point of view of global energy consumption and subsequent environmental impact, the tonalities show darkening. One of these elements applies to countries with a capitalist pattern of development, that we can call mature. It is the case of a de-industrialization, which beginning can be traced to the second half of the 1970s, after the great increase in the oil price; the result thereof is a concentration of economic activity in the services and finance areas, which generally are less energy-hungry. However, the density of the exchanges and the popularization of personal mobility in owned vehicles pull in the opposite direction. These changes in the industrial structure – quantitative and qualitative – in the rich countries corresponded to the relocation of sectors of activity in their entirety, such as the steel industry or industrial components, for ecological reasons but, above all, to where environmental damages are less valued, labor prices are lower, labor standards are less demanding, and political regimes more intractable in the face of workers' demands. In global terms, this relocation does not have major impacts on energy consumption at the production level, but since the gap between production and end use greatly increases, it promotes a substantial increase in the use of logistics and transportation networks, with a consequent increase of harmful emissions. Thus, in the above table, the reductions observed in rich countries will have to be devalued, given that they correspond to a part of the increases seen in the peripheries; there is little change to the global situation. Those countries with high or medium incomes went through a decade of underperformance in their economies, following the financial crisis symbolically started with the collapse of Lehman Brothers. And that had a natural negative impact on energy consumption. The concern with the impacts of economic and domestic activity on the environment has developed a lot in the last decades, with measures that focused on industrial pollution, waste, soil and water contamination, the danger of nuclear, vehicle emissions, with production of industrial and domestic equipment with lower consumption. The massification of electric vehicles will last a few decades because family incomes are conditioned by wage compression and fiscal pressure, and, while vehicles continue to consume energy, of whatever kind, it will have to be produced somewhere. Given that the environment is global and does not recognize state boundaries, transfers from rich countries to the periphery of more energy-consuming economic activities per product unit, do not admit that mandarins and half-baked ecologists present themselves as champions of environmental defense aiming at a smaller environmental impact; the latter is only, globally speaking, transferred to another place, is false in substance or even increased. Many of the new "industrialized" countries, besides the heritage of economic and social disruption arising from the western colonization, include a set of industrial patchwork not integrated with each other but rather in the supply chains of multinational companies; and as incomes are not high, better, they are clearly below those in the rich countries, there is a lack of resources to avoid poverty, a more rational use of energy consumption or to produce acceptable environmental costs. In turn, the political classes in the peripheral countries, becoming the agents of transnational corporations and propagandists of the consumerist models of Western societies, seek to reconcile the increase of their incomes and staying in power by raising the living standards of their (growing) populations; a difficult balance in which the efficiency of energy consumption and the quality of the environment are hurt. Among the countries considered and with higher capitalist development, the indicators are higher than the world average and, for the most part, have a decreasing penchant. Among the EU countries considered the only registered increases in consumption per capita are in Poland and Portugal. The highest per capita consumption cases are observed in Norway and the USA, in 2007, while the latter is surpassed by Saudi Arabia in 2017, which has a remarkable growth, as is the case with South Korea. China became, in 2017, the largest energy consumer, overtaking the US which occupied that position ten years earlier. However, the per capita energy consumption in the country, despite having grown in the decade, is still less than 1/3 of the north-American capitation in 2017. The energy consumption per capita in Africa and India are particularly low and, together, account for about one third of Humanity. To sum it up, capitalist development has prompted evident effects on energy consumption growth. The high capitations of the so-called developed countries (or the Saudi oil monarchy) tend to be the example to be followed by countries that want to follow that model of capitalist development. The accelerated entry of vast regions, mainly from Asia, in that process, leads to local increases in the capitation of energy consumption, in exchange for the reductions observed in countries with older capitalist structures that tend to reduce their rates of energy. These two trends, of opposite signs, may in the medium term cross each other in a narrower range, to the extent that new technologies allow sufficiently low costs, accessible to the large social groups with low incomes of the rich countries and to the increasing medium levels of the so-called developing countries. What will the result be? More frequent conclaves of the Katowice type where distinguished members of the national political classes, multinational-emanated-order-holders, meet to present no more than placebo solutions or topped-up scams, such as the EU proposal mentioned above, might be invented. On the other hand, not everything can be solved by individual attitudes and practices conducive to a minimum contribution to climate change; it is known, in particular, that individual practices are heavily marked by the consumerist ideology that presents itself as the instrument to achieve happiness. Even if, as we saw in the first part of this article, the main responsibilities for environmental deviation lie with the energy industry that exploits fossil fuels and its concern to restrain investments that hinder the distribution of profits to shareholders; an industry that is well inserted into the control towers of state decisions. If the cause of Humanity's sufferings and the damage caused to the global environment is capitalism, in general – and its promoters and beneficiaries in particular – to focus the combat on its nefarious effects solves little or nothing. It's like trying to wipe the water that flooded a house, without closing the tap from where it flows. A global, concerted and united action of the peoples is necessary for it is known that capitalists and the political classes will do anything to divide humans and suppress all efforts that affect the production of profits or their privileges. To think otherwise is similar to expecting to find Santa Claus sitting in the chimney unloading his bag of presents. One should raise the question of a change in the way of organization, coexistence and interrelation between humans; credible or visible results will hardly arise with the presence of a capitalism going at cruising speed. It is from human coexistence, from the reformulation of its life goals that the great changes in the paradigms of social construction will arise. The decrease or the responsible consumption practices, per se, are only ways of measuring the footprint of the march of capitalism; they can make it reduce the pace of the march but cannot cause it to fall to the ground. In this context, it is the whole edifice on which capitalism is based which must be called into question; it is necessary to move beyond denunciation and not to narrow the action into compromised solutions packed into undersigned lists sent to the great economic and political powers, on the assumption that they will change course; actions that, in fact, do not mobilize anyone beyond an absent-minded signature. Once again the vain hope of repentance (inserted in the Christian ideology) arises by the hand of the architects of the constant adaptation of the capitalist system aiming at its sustainability. In the most sacred of their logic is that of capital accumulation, and they cannot have any other, because any alternative would be its death; and therefore, of their own accord, they will never change anything essential. These pious initiatives can serve as entertainment for many who think they can civilize the capitalist savagery, sensitizing the political classes’ mandarins, seeking support among them. This does not happen, especially with powers so much structured and full of ideological, material and financial means to deceive, to lead, and to repress the plebs; without the aforementioned rhizomatic network that frames millions of people, we will not go anywhere. Capitalism may face, in an apocalyptic setting, the start of a reduction of the global population to 600 million people; but cannot admit global conditions as extreme as social chaos, with popular uprisings in which capitalism itself is thrown out along with the bath water. For Humanity to avoid this apocalyptic scenario, its only recourse is to extinguish the current economic paradigm – capitalism – and the present political model of representation, which we call “market democracy”. Everything else is but placebos. The table below shows the world’s primary energy consumption (measured in millions of PET – petrol equivalent tonnes) broken down for each major energy source for the years of 2007 and 2017. Globally and in the decade ending in 2017, all types of energy consumed have their overall volume increased except for nuclear power, with strong reductions in Germany, Italy, in France, and in Asia Pacific. In the latter after the forced closure of Fukushima. In Europe, in general, there is a decrease in the consumption of fossil fuels, especially in the case of coal, with a particular exception in Turkey. The cases of consumption reduction are almost restricted to Europe and North America and it is not possible to accurately measure what has resulted from measures aimed at reducing emissions and what has resulted from the aftermath of the financial crisis. In Central and South America, as in Africa or Asia, consumption of fossil fuels has generally had a significant growth. As for hydro electrical and other renewable energies, we highlight their great progress in the Asia-Pacific region, which presents itself as the leading producer of both; especially since oil and natural gas are not very abundant there. The use of fossil fuels corresponds to more than 85% of the energy consumption in 2017, with any positive evolution that may have occurred since 2007 being of little significance. In what regards oil, in a context of slight changes in its overall relative relevance over the period 2007/17, it should be noted that the increase in its consumption in Europe and in Africa, with reductions in its role in the Middle East and Asia-Pacific. As for natural gas, there is a sharp drop in its use in Europe, with significant increases in its share in North America, the Middle East and Africa. Nuclear energy is only relevant in some countries of Europe and North America. Coal, being the most polluting of fossil fuels, has maintained its share in overall consumption. We highlight the decrease of its use in North America and Africa and that its main consumption is observed in Asia Pacific. Large US banks, the ones "too big to fail", distribute 80% of their credits to "investors" in speculation and financial activities. The cascades of issued securities having at their base agricultural produce, mineral fuels, real estate credits that since the 90s have shaped so-called derivative products that constitute the great destination of these credits, according to the BIS - Bank of International Settlements. CIS - Commonwealth of Independent States, an ephemeral structure comprising former Soviet republics.